A very Merry Christmas to you all! I will taking a short break from blogging because I will be in the country with no internet access for about a week. I will be back shortly with hopefully lots of finishes to share! I hope Santa is good to you! Things have been absolutely crazy over here so far this week. This is also my last week at work before 2 weeks of vacation so it's been a little hectic. But I am slowly getting into the spirit of the season! We decorated our little Christmas tree - it is pretty pathetic looking really, but I love it for some reason. Sitting next to it at night watching TV just makes me so happy! That's it for now. Talk to you all later. When I posted my goals for this weekend on Thursday night, I said I would be back on Sunday to report on how I did. 1. Finish piecing and sew the borders on Nine Patch Flip. - Done! But forgot to take a picture! 2. Prepare the quilt sandwich for the Big EZ (my new bedroom quilt at the cottage). - Not done. I didn't buy enough fabric for the backing (I forgot I added a 7 inch border all around)! 3. Quilt and bind Spin City. - Done! I'll post a picture later this week. 4. If time allows, start cutting Veranda for Two Percent. - Done! I should be able to start piecing when I go back to the country Christmas night. In addition to everything I was able to do above, I also quilted and put the binding on Lincoln and cut some more of my scraps into 2", 3 1/2 " and 5" squares. That's it for now. Talk to you all later! I need to start setting goals for my weekends so that I don't end up going home on Sunday night only to realize that I really didn't get done a lot of the stuff I really wanted to get done. So I decided that every Thursday night, I will post my goals and projects for the weekend and then report on how I did when I get back to the city on Sunday night. 1. Finish piecing and sew the borders on Nine Patch Flip. 2. Prepare the quilt sandwich for the Big EZ (my new bedroom quilt at the cottage). 3. Quilt and bind Spin City. 4. If time allows, start cutting Veranda for Two Percent. A couple of weekends ago, I cut and started piecing my last 4 Hometown Charm Packs and this weekend, I almost finished the Nine Patch Flip top. All that's left to do is piece the borders and sew them on. This pattern is called Nine Patch Flip and I found it in the latest Pam and Nicky Lintott book. I love how this little quilt is coming along. I wasn't sure about using that shade of blue as the accent fabric, but in the end, I'm really liking it. Sorry about the awful picture! The lighting was really bad and I couldn't be bothered to go outside. I plan on finishing up the borders next weekend and that will be another top finished! I hope to be able to get started with this one next weekend! This weekend, among other things, I decided to organize my scrap basket. Actually, my scrap basket is a pretty big white plastic bin into which I've been throwing scraps since I started keeping them. 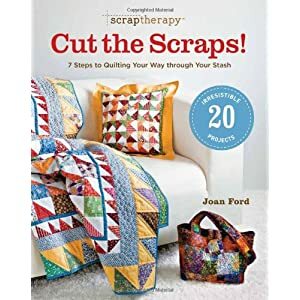 To be honest, when I started quilting about 3 years ago, I didn't know you could re-use scraps to make "scrappy" quilts, so I used to throw them away. I know, I know... pretty bad heh? :-) When I realized, through reading blogs and researching on the Internet, that scraps could be used to create really beautiful quilts, I bought the plastic bin and began keeping any piece bigger than a 2" x 2" square. In this book, the author teaches us to organize our scraps into piles of scraps of 3 different sizes: 2", 3 1/2" and 5" squares. Then the book provides a bunch of really nice patterns in which you can use the squares. Look at what came in the mail a couple of days ago! The Fat Quarter Shop was having one of their amazing sales a few weeks ago and when I saw the Veranda collection on sale, I just had to get me some of it. I ordered 2 sets of 10" squares and some yardage. With all of this goodness, I plan on making myself a "big" Schnibble. Haven't decided which one yet though... Decisions... Decisions! Wow! I cannot believe I haven't posted in over a week. Been busy, busy, busy with stuff other than quilting unfortunately. Work is crazy, Christmas is less than 3 weeks away now and D decided we needed to re-paint the whole house! Seriously??! Anyhow, life came back to "normal" over the weekend and I was finally able to get some quilts finished. First, I quilted and sewed the binding on the two small table toppers I made a couple of weekends ago. I wrote about these in my last post. Notice the cute rick-rac on there? I just love it! These two cuties are now sitting proudly on top of the two end tables in the living room at the cottage. I also finished my grand-mother's "birthday" quilt this weekend... her birthday was in July!!! So I guess this is now my grand-mother's Christmas present. I'm very happy with how this one looks. The pattern is called Nine-Patch Wonder and I found it in the Pam and Nicky Lintott Jelly Roll Quilts book. I used a fabric collection called Martinique by Moda for it. Our neighbour Dave is holding the quilt! So funny! I briefly mentioned these two table toppers in my last post, but I thought I'd show pictures today. I needed a pattern that would require only about 1 charm pack because that's basically what I had left of the Recipe for Friendship fabric. So I searched the Internet and found this really easy and cute pattern and tutorial on Sherri's blog - A Quilting Life. I was able to piece both tops on Sunday and now I only have to put the ric-rac decoration and borders on. I should be able to get that done this weekend, after doing some major Black Friday shopping! 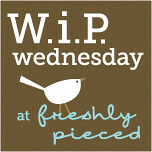 I'm linking up to Freshly Pieced for W.I.P. Wednesday. Don't forget to go check out what everyone else has going on this week. I had a very productive weekend at the sewing machine this week. First, I finished my Ducky mini-quilt. He will be on his way to Boston later on this week. Second, I quilted and put the binding on X-Rated. This is a Schnibbles I completed last month. I used a scrappy binding for this one and I'm very pleased with the results. The picture really isn't great - it was way too cloudy and windy to go outside so had to settle for an indoors picture. I'm not quite sure X-Rated will stay on the coffee table at the cottage. I'm thinking it may find its way under the Christmas Tree (I'm way behind in the gift-making department!). I also pieced 2 more small tops and started cutting charm squares for a new quilt top using the last 4 Hometown charm packs I had left over after completing Lincoln. TNT Thurday - I'm all ducky! During my bloggy travels last Thursday, during TNT Thursday, I read on someone else's blog that they were trying paper piecing for the first time and really liked how easy it was. When I got to the cottage on Friday night, I decided I was going to spend at least a little bit of time trying to paper piece something simple. I remembered seeing a pattern in a past issue of Quilt Magazine that looked really cute so I went searching for it. I l.o.v.e. it!!! And it really was easy! I decided not to put a binding on this mini quilt so instead I stitched the front and back right sides together with a piece of batting at the back (leaving a small opening) and then turned the whole thing through the opening. The pattern said to use embroidery for the eye, but I decided to use a small black button instead. In this picture, I hadn't pressed it yet or closed the opening, but I'll do that this weekend. I'm also going to do some echo quilting around the ducky and something else on the duck itself... not quite sure yet. Any suggestions? And what did you try this week? I'm linking up at Melissa's for TNT Thursday. Be sure to check out what else everyone is up to this week. I made really good progress last weekend on the new quilt for my bed at the cottage. This is the one where I decided to let my 7 year-old choose the fabric so I'm thinking of calling it "Dylan's Choice". I used a pattern called the Big EZ from the book Bloom Creek Quilts. This quilt top came together really fast and easy... gotta love those big blocks! The finished top actually wasn't big enough for my bed so I added the border. I really like how this one turned out... I may have to let Dylan choose the fabrics more often! I've also been working on my Granny Squares and Crochet School over at Craftyminx's blog went over seaming this week so I started joining my squares. I really love how this is coming together. This is going to make a really cute and soft baby blanket. 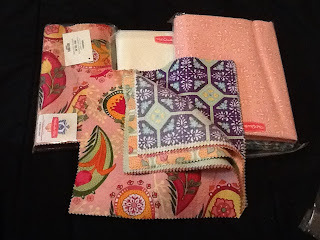 I'm hoping to quilt X-Rated and Spin City this weekend, but I also want to get started on a quilt I have planned for the lovely fabric I won from the Fat Quarter Shop. I'm linking up at Lee's from Freshly Pieced! Be sure to check out what else is happening in blogland! Canada Post came by the house late last week to deliver the fat quarter bundle I won from the Fat Quarter Shop. This is a designer bundle from Bonnie & Camille and it's got 15 fat quarters (3 are solids). I love it! I think I've already decided which pattern I'm going to use these for... more to come! I'm linking up to Happy Quilting today for Try New Things (TNT) Thursday. What have I tried this week? Well... I've wanted to make a new quilt for my bed at the cottage for a while now so I finally decided to get started. I found an easy and fast pattern in one of my quilting magazines (I can't remember what it is right now, but I'll post the information when the top is finished), but I couldn't, for the life of me, decide on which fabrics to use. So - I asked my 7 year-old to choose. I told him the number of different fabrics I needed, told him they needed to have purple in them and I let him go! Check out what everyone else is trying out this week at Happy Quilting. I have to say... I love working on Schnibbles and other small quilts. I was able to complete the Lincoln top this weekend in less than a day. I'm in love with the Hometown fabric collection. The reds, greys and soft blues are beautiful and the different fabrics just come together so nicely. Very soothing for the eye. The pattern by Carrie Nelson called for beige background fabric for the star blocks, but I decided to use some of the lighter 5" squares instead for a scrappier look. That's it for now. Talk to you later! I decided to link up to T.N.T. Thursdays at Happy Quilting today to show off what I've tried this week: Crochet! So here is my very first Granny Square. It is not perfect, I made one or two mistakes, but these squares are soooo easy to do and so much fun! I think I found something to do during the week to satisfy my need to be "crafty"! So be sure to visit the Craftyminx for some crochet lessons and pay a visit to the Happy Quilting blog and all other bloggers trying something new today. So I finally cut into those beautiful 5' Hometown charm squares this weekend. All of these little pieces will come together shortly to form "Lincoln". Lincoln is a Schnibbles from the book Another Bite of Schnibbles by Carrie Nelson. I cannot wait to start piecing next weekend! Thanks for coming and don't forget to visit everyone participating in W.I.P. Wednesday at Freshly Pieced. I still cannot believe it, but I won some gorgeous fabric yesterday! Go see this post on the Jolly Jabber to have a look at what I won! Happy Halloween everyone! Well it was a treat for me today - these little beauties were delivered to my door while I was at work. Aren't they gorgeous? This is the Northcote Range collection by Cabbages & Roses for Moda. I love the soft palette and the beautiful roses... I cannot wait to put these together into a quilt. Any treats for you today? Another finish to show! I managed to finish the quilting and put the binding on McGuffey this weekend. I quilted in the ditch around each square and then along each small square within each square. I really like how this one turned out. Such happy colours! This is the back. I used the panel that came with the Recipe for Friendship fat quarter bundle for the back. This one is going to be a Christmas present for my wonderful friends and neighbours in the country: Vicky and Claudia. I got a new toy! I've been wanting a new sewing machine for months now, but there is simply no way I can afford the one I really want so I had come to terms with the fact that my little machine was going to have to do for a few more years. It's definitely not one of those high end machines, but it's got features I never had on a machine before like the needle-down feature, speed controls and lots and lots of different stitches! Red & White Placemats finished! I had way too many finished quilt tops on the go and too many projects I wanted to get started on so with Christmas now 9 weeks away, I decided I needed to start actually finishing projects. So this past weekend, I quilted and put the binding on the set of 4 placemats I started a couple of months ago. I love how they turned out. I quilted in the ditch around the white parts and machine stitched the binding - mainly because I hate hand stitching and because I'm guessing these placemats will need to be washed over and over again and I want them to stay together! I still have to put a label on these little babies, but I think I want to make special Christmas labels for these gifts so I'll have to put them on later. I still had quite a few Recipe for Friendship 5" squares left and wanted to try something new after sewing 3 different Schnibbles designed by Carrie Nelson. So I decided to do a little "research" on the Moda Bakeshop website and found this great little pattern. The pattern is called Baby Lattice Quilt and it was designed by Amy Smart from Diary of a Quilter. I really, really enjoyed making this little quilt. It came together really fast, the instructions were clear and easy to follow and the end product looks amazing. So I'm down to about 40 5" charm squares in Recipe for Friendship and I'm thinking of making another little table topper from the pattern Coming Home. This is a pattern from the Simplify book written by Camille Roskeley. I already used this pattern to make small table toppers for my bedroom furniture at the cottage. Farmer's Wife... Now I know! During my bloggy travels lately, I've read numerous posts and looked at lots and lots of pictures of beautiful 6" blocks related to the Farmer's Wife Sampler Quilt. At first, I really didn't know what the heck these people were talking about, but I really did enjoy looking at all the pictures. Finally, I read someone's comment on a blog and this person was saying how she had bought the book and was going to get started on these blocks. My curiosity finally got the better of me and I logged on to Amazon.ca and searched for this book... and ordered it! :-) I love reading all the letters; I'm a big history fan, so all of those letters are simply a delight for me. I might actually try making some of these blocks as a way to use my scraps... who knows - maybe I'll be able to make enough to turn these little blocks into a small lap quilt or even maybe a twin-size quilt. We'll see! Another Bite of Schnibbles was finally delivered today! Yay! The photos aren't great, but you get the idea! I cannot wait to get to the cottage Friday and get going on one of these lovelies! We really got a taste of Autumn this weekend... cold, wet and extremely windy! So although I had planned on cleaning up the garden this weekend and getting it ready for winter, I really only got to do the bare minimum. We put all the patio furniture away, emptied the flower boxes and removed all of the "decorations" we had in the garden. I also spent quite a bit of time in the sewing room this weekend, which was amazing! I finished the X-Rated top, prepared the backing and basted it so it'll be ready for quilting. So I said I was going to try quilting without buying fabric for a few months, but I never said anything about not purchasing new books! I visited the Fat Quarter Shop a couple of nights ago and ordered Carrie Nelson's Another Bite of Schnibbles. I cannot wait for Canada Post to deliver it! The weather was just terrible this weekend so that means... lots of sewing time for me! I finished my Spin City top and pin basted it so it's ready for quilting. I also cut and started piecing X-Rated, another Schnibble from Carrie Nelson's Schnibbles Times Two. This top will be finished next weekend. Oh and the postman finally came on Friday with 6 wonderful Hometown Charm Packs. I cannot wait to get started sewing with these cuties. The colours are a perfect match to the colours in our kitchen at the cottage so I'm thinking a couple of curtain panels or maybe placemats and a table runner. 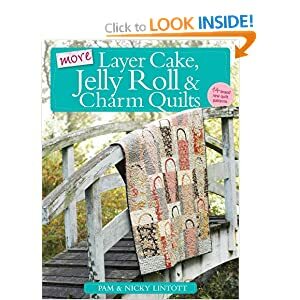 I spent the better part of last year making quilts with Jelly Rolls... those beautiful, gorgeous, yummy rolls of fabric that are so much fun to play with! So this year, I decided I was going to try to make quilts with Charm Packs - the cute 5" squares. A couple of weeks ago, I posted about cutting up a Recipe for Friendship fat quarter bundle into 5" squares and so far, I've made 2 quilt tops with those: McGuffey and Spin City (both are Schnibbles for Carrie Nelson's book Schnibbles Times Two). I haven't yet posted pictures of Spin City but McGuffey looks amazing. In fact, I'm loving these little 5" squares so much, I signed-up for the Fat Quarter Shop Charm Pack Club where 6 identical Charm Packs will be shipped to me every month. September's fabric line: Hometown! So I am anxiously awaiting Mr. Postman who should be delivering my beautiful Hometown Charm Packs any day now! This weekend was very productive, but I have zero finishes to show you! I do have a couple of finished tops and a couple of finished blocks... and a couple of new windows. First, here are place mats that are ready for quilting. I found this pattern in the February 2011 Quilter's World magazine. I used fabrics from my stash for this one. I had told myself I would get going on the quilting on these this weekend, but then I really wanted to work on something else... Quilting is most definitely my least favourite part of the whole process so I tend to put it off until I can longer put it off. Next, here is McGuffey. I used two of my Recipe for Friendship charm packs for this one as well as white fabric I had in my stash. For the backing, I used the Recipe for Friendship panel that came with the fat quarter bundle. McGuffey is a Schnibble designed by Carrie Nelson and which can be found in her book "Schnibbles Times Two". Third, here are two blocks from my next project: Spin City. This is another Schnibble designed by Carrie Nelson (also from the Schnibbles Times Two book). I'm using the Recipe for Friendship charm packs for this one as well and so far, I'm loving it! The blocks are fairly easy to do, but I'm using a technique I've never used before: quilting with a template.